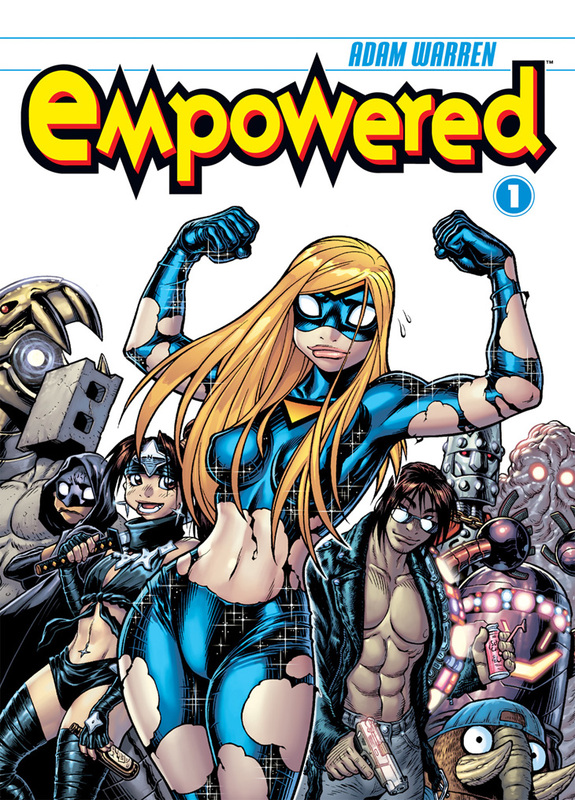 Starting way back in 2007, Empowered has been released as a series of (ahem) Original Graphic Novels—or “OGNs,” to the cognoscenti. That mildly pretentious term means that each installment hit the shelves as a big ol’ trade paperback without first being seeing print in the monthly “floppy” or “pamphlet” form that most superhero comics are conventionally published in. I’d planned from the start of Empowered’s print-comic release to eventually serialize the book online but, well, never quite got around to it. Years later, I’m very happy that to partner with HiveWorks for this “better late than never” online release! Well, lemme kick off the commenting by taking a quick peep at the cover illustration from Empowered vol. 1, as seen above. I should clarify that I did the pencils and inks for the piece, with the color art provided by my buddy Ryan Kinnaird. Unlike most of the multi-talented artists in HiveWorks’ stable, I am at best semi-literate in the language of Photoshop, and must rely on more widely skilled friends to handle the occasional color work that Empowered requires. If I do say so myself, this cover isn’t a bad illustration at all, but is plagued by a few stylistic idiosyncrasies and artistic choices which no longer appeal to me. My art style hasn’t evolved all that radically over the last decade, but the intervening years—and 2000-odd pages of Empowered production—have nonetheless burned me out on certain tics and flourishes I favored back at the series’ start. My main problem, here, would be the undulating wonkiness of our title character’s lower torso and hips, which kinda got away from me somewhere between initial rough sketch and finished inks. For the record, you’ll see far more severe lower-torso wonkiness on poor Empowered—or “Emp,” for short—in pages to come. For much of this series’ early volumes, I was plagued by an sporadically recurring drawing error that, years later, I’ve dubbed “The Mysteriously Intermittent Millennial Torso Glitch.” Every now and then, for reasons still unclear to me, I’d end up drawing Emp’s waist excessively—if not bizarrely—skinny, despite having no deliberate intention of depicting her so. Oddly, the Torso Glitch stopped recurring four or five years ago; in a future commentary, I’ll rattle off my semi-plausible theories and half-baked rationales for why this problem might’ve happened to my artwork.